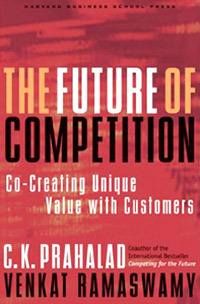 In this visionary book, C.K.Prahalad and Venkat Ramaswamy explore why, despite unbounded opportunities for innovation, companies still can't satisfy customers and sustain profitable growth. The explanation for this apparent paradox lies in recognizing the structural changes brought about by the convergence of industries and technologies; ubiquitous connectivity and globalization; and, as a consequence, the evolving role of the consumer from passive recipient to active co-creator of value. Managers need anew framework for value creation. This book is about the emerging "next practices" in value creation. In this emerging opportunity space, companies must build new strategic capital - a new theory on how to compete. This book presents a detailed view of the new functional, organizational, infrastructure, and governance capabilities that will be required for competing on experiences and co-creating uniquevalue. This is the future of competition. Изд-во Harvard Business School Press. 2004 г.